Two kids were yesterday injured as another three-storey building, which was already marked for demolition, collapsed at Kakawa Street, Lagos Island. This is just as 20 persons cheated death after the marked building caved in and fell on a nearby bungalow and another three-storey building at its back. 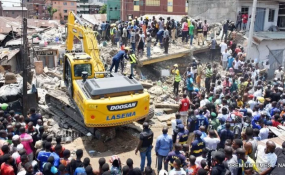 The collapse came barely two weeks after the Itafaji building collapse on Lagos Island claimed 20 lives and a similar one at Egerton Square, Oke Arin, injured four persons. At Kakawa, one of the survivors, an Islamic scholar, Ahmed Lawal, who resides at No. 50A with his family, said his daughter was one of the injured kids. According to him, his daughter had used the toilet and was returning, when the collapsed building fell on their structure. He said: "When the incident happened at about 12.50 p.m., majority of us (tenants) in 50A Kakawa Street were outside, trying to assist a shop owner at the down floor of the collapsed building when it came down on ours. "We all took to our heels, but I immediately turned back when I remembered that my daughter was inside. "With the help of other people around, we were able to rescue my daughter, Fatimo and Alaba Audu, my neighbour's son. My daughter was taken to Fehintola Private hospital at Bamgbose street, while Alaba was taken to the General Hospital for medical attention." The owner of the boutique under the collapsed building, Muritala Ageshin, while thanking God for sparing his life and that of his junior brother, said they were packing out their goods when the incident occurred. He said: "My brother and I were inside the shop packing our good because the Lagos State government officials came last Friday and gave all the tenants in the building quit notice with instruction that they are coming today to demolish it. " "All of the tenants complied and packed out at weekend. We just had some little items to pack out, which was what we were doing when we heard a sharp sound and the building caved in. We broke the shop glass door to escape." Meanwhile, the Lagos State Government has urged occupants of all distressed buildings to relocate, pending the arrival of the demolition team of Lagos State Building Control Agency (LASBCA). While disclosing that relief and resettlement centres have been opened to accommodate those affected, the Commissioner for Physical Planning and Urban Development, Prince Rotimi Ogunleye, said yesterday's incident did not record any casualty. He said: "The building in question had been identified as distressed by the officers of the LASBCA and all the necessary statutory notices had been duly served. It was one of the defective structures marked for removal by the agency. "Fortunately, occupants had been evacuated before the incidents occurred. Immediately, the Lagos State Rescue Team and LASBCA were alerted and they moved to site promptly to check all adjoining buildings so as to evacuate the occupants to avoid any further hazards. "Already 25 buildings have been removed by LASBCA as the government has stepped up measures to rid the state of distressed buildings so as to prevent loss of lives and property due to sudden collapse in the state."